Siouxland Energy Cooperative’s grain program offers a variety of advantages for our producers. Every fall, we receive approximately 6-7 million bushels. These bushels are received at approximately 40,000bu/hour. During harvest, 5 million of these bushels are cracked and packed in our 1050 foot by 262 foot cement bunker. 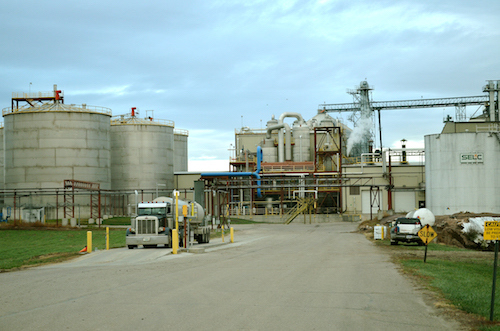 The remainder of the bushels are processed through the plant or stored in grain bins. During the rest of the year corn is received daily at rates dependent on our milling needs. Grain up to 22% moisture is received from our members in the fall and up to 19% the rest of the crop year. Producers use our partially automated scaling process, making their time spent from inbound scale to outbound scale roughly 7-10 minutes. A ticket is generated at the outbound corn detailing the deliverys gross and net bushels, moisture, and test weight. This information can also be emailed or received by text message to help keep the producer's records up to date.